Search and adopt a Lakeland Terrier near you. The Lakeland Terrier's personality has a charm and companionability that are difficult to equal. His intelligence, sense of humor and zest for life make him an attractive choice for an active family. 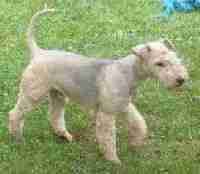 The Lakeland Terrier originated in the Lake District of Cumberland, England near the Scottish border in the 1800's. He is related to several terrier breeds and is one of the oldest working terrier breeds still in use today.